The PC should have seen him twice. Not if Hutchinson was not there on the night, he wouldn´t. Last edited by Fisherman; 10-11-2018, 03:28 AM. he may have been at the inquest, outside the doors, talking to people on the streets, etc. or -He was staying at the victoria house a stones throw from the Kelly murder scene, he could have picked it up there. even if he hadnt even heard of Lewis at the inquest, he may have simply wanted to wait until the inquest was over before coming forward, for obvious reasons if he wasnt telling the truth. Maybe this, maybe that...if's, but's & maybe's. There's no maybe about what Hutchinson said, no maybe about what Lewis said. .......again for the millionth time-NO. physically impossible for lewis to have seen the same couple hutch did. Aman and Mary were already inside by the time Lewis arrived. talk about "ridiculous"! give it up man. Lewis tells us where she was at 2:30, Hutch doesn't tell us where Aman & Kelly were at 2:30. So your dogmatic claim is pure speculation. The only thing Lewis corroborates is that hutch was standing out in the middle of the night, with no good explanation, waiting and watching "for someone to come out". creepy suspicious behavior if ive ever heard it. There was a lot of 'creepy' men reported in the press, that doesn't make them all killers. The East End was a creepy place. Top cartoon. There is Hutchinson's mother of Jews description. You couldn't get much better than the details in that drawing. A fully fledged out composite of JtR with horseshoe necktie pin and all. Now look to left. There is Hutchinson looking surprised at this ghastly fellow picking up MJK. Now look below that drawing and there is an officer. His name is L.63. His real name still a mystery. Look at the L.63 is saying 'I was on duty all night and never heard a sound'. So apparently Lambeth 63 wasn't present when Hutchinson's man picked up MJK and didn't see anything (never heard a sound). L.63 is Hutchinson's corroboration... or at least should be. How is it that Hutchinson who claims to have been there for 45 minutes didn't see this PC on his rounds? We spoke about PC L 63 last year. Monty identified him, the name escapes me at the moment, but I think he was on duty in Commercial Street, not Dorset Street. As is the Lewis story which altered dramatically between statement and inquest and the constant cloak changes between Kennedy and Lewis . It was George Sims who called them sisters. I think they were just friends, but no matter. Kennedy will turn up, she is being looked for. Maxwell was the last sighting, not Kennedy. Why do you think Maxwell was called, it wasn't for pantomime. It's been pointed out for months now, the most prevalent theory over that first weekend on this murder was that Kelly was killed after 9:00 on Friday morning. That, is why Maxwell was called - the last person to see Kelly alive. Apologies ..... of course Maxwell was the last sighting, inquest wise anyway . That honour should really go to the unknown woman in the times . What I should have said was that the Kennedy sighting should have rendered Sarah Lewis' sighting as irrelevant . It is unfortunate that she has no credibility due to not being able to come up with the same story twice . You pointing out your own thoughts does not make them factual . ....They may appear to be to you . Regarding the examination of George "Toppy" Hutchinson's handwriting, and the possibility of the wrong exemplar having been used, Russell Edwards recounts an incident involving the Swanson Marginalia in his book Naming Jack the Ripper. Back in 1988, a photocopy of the Marginalia was sent to the Home Office, and this was compared to a known sample of Donald Swanson's handwriting by one of the forensic examiners, Dr. Totty. He came to the dramatic conclusion that the two writings were NOT written by the same person. According to Edwards, this set off alarm bells, but it was eventually concluded that Totty had not been given a genuine, legitimate sample of Swanson's handwriting. An error had been made. Although the signature on the document was indeed Swanson's, and it did originate from his office, the main body of the report had been written by an amanuensis or secretary, so the comparison had been flawed from the beginning. Other exemplars were then re-examined and the Home Office felt that the Marginalia matched Swanson's handwriting. So reports Edwards. Similar deal? 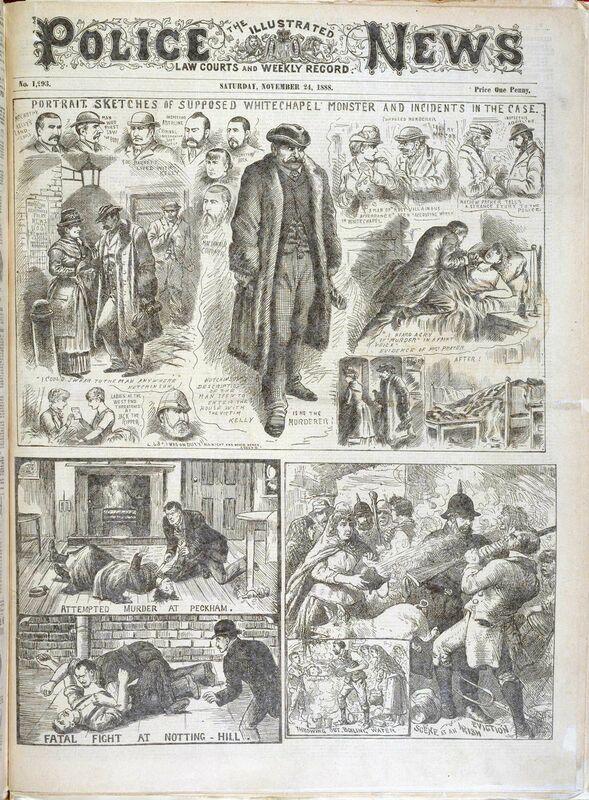 If the illustrations on the newspaper cover depict the people closely in likeness, does this mean the man looking on at Mary Kelly meeting the described suspect is the likeness of George Hutchinson? I doubt it. Whilst the illustrations of the better known characters (senior police figures, doctors) might have been, the drawings of Kelly, Mr Astrakhan and "Hutchinson" were quite probably made up. I agree with Sam's reply, though it must be noted that the date of the IPN sketch was 24 Nov. So an IPN reporter had about 10-12 days to meet Hutchinson and offer a true likeness for a sketch. That said, the only identifiable detail offered by Sarah Lewis was the wideawake hat, so an IPN reporter has no need to locate Hutchinson, just draw a male wearing a wideawake hat and readers will know who it is supposed to represent. I wouldn't put a whole lot of faith in either of those three characters being true to life.